Diversity reigns in Nou Barris, a Barcelona neighbourhood that is outside the city centre and is quiet, but still has all the urban charm of the downtown area. 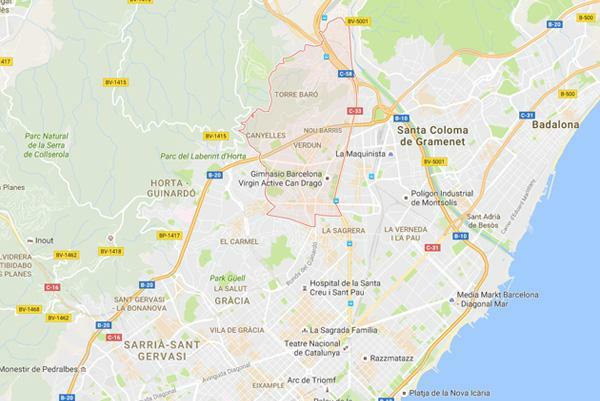 Just a short 20-minute car ride from El Prat airport, Nou Barris is an eclectic mix of many origins interspersed with green spaces that add a dab of suburban feel. Visitors who want to experience a little bit of everything Barcelona has to offer will find it here. Nou Barris is a great place to stay and see everything in the city. It’s a quiet area, but still offers easy access to all that you want to do and see. For example, you’re just 30 minutes from Sagrada Familia. This neighbourhood offers you all the basics when it comes of accommodation, dining, and entertainment, but with a draw that is like no other. New businesses are cropping up all over Nou Barris, but it still has a small town feel that you’ll love. Despite being billed as a quiet part of the city, Nou Barris has plenty of attractions that you’ll want to add to your itinerary. Play or watch at one of the neighbourhood’s skate parks or mingle with the locals in the town squares. Walk through Parc Central and see the many stone sculptures there. The Passeig Valldaura is the perfect place to do some shopping for clothing or artisanal foods. You’ll also want to see the Santa Creu Mental Institution, which is now a library that retains stunning architecture and lots of history. The Mercat de la Merce is a great place to sample the cuisine of the area.